I picked this up on a whim in my last Body Shop haul as it was recommended to me in the sidebar. As someone who never gets enough sleep and whose skin has been a little lack lustre lately, I had high hopes and I can safely say that this has not let me down! 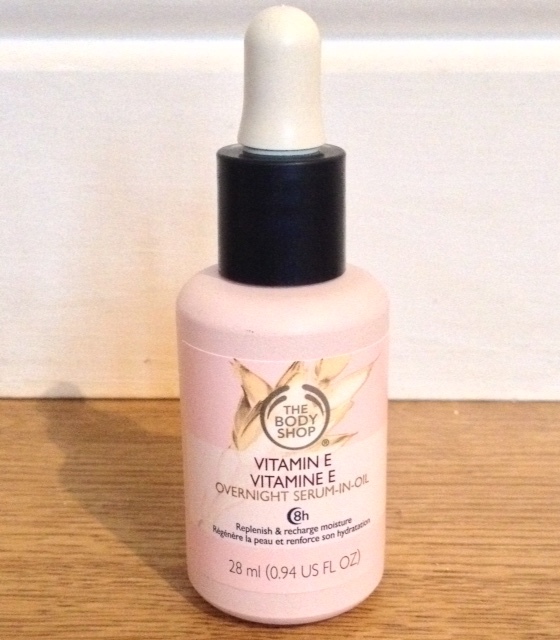 The Vitamin E Overnight Serum-in-oil claims to "Give the appearance of 8 hours sleep... replenishes and recharges moisture... leaving the skin looking fresher, more rested and radiant". I absolutely love the smell of this and think it is perfectly gentle for a product you apply just before you go to sleep. I can't quite put my finger on what the smell is, but it reminds me of aromatherapy treatments I've had before. With the syringe applicator, I apply a few drops onto my fingertips and sweep gently over my face in an upwards motion. I find that the oil is really light and doesn't feel greasy and soaks into the skin beautifully, and when I wake up my skin is definitely more hydrated, glowing and I look rested and more awake. It has really helped to give me that radiant dewy make up look that is perfect as Spring approaches. This retails at £13 and you can find it here.